The nice thing about the Google doc is you don't have to update it if you're inactive. If you're inactive, you don't change your resources, so the values continue to be correct. You could just update it like me - update every time you put something in/out your collective storage. I didn't have to update my own values for multiple months. I just had to update the spreadsheet by copying values weekly. Also the reason I let it be less frequent is to take into account if such a situation will happen again, which seems likely. And I haven't really felt like implementing any changes to UBSR laws for a very long time for the same reasons as my own inactivity on the server. as of the quartz you gave me from the collective storage Bla, i actually needed quartz and not blocks so i will be giving them back in the chest i got it from. I took 12 quartz blocks from the chest and placed 16 quartz items. What happened to the other 4 quartz blocks? You can take the items I placed now. Bla, books and bookcases maybe? You seem intent on adding everything with value. I think I need a new collective storage for the hundreds of new items! The collective storage doc is now updated. Everyone should update it with their collective storage items so it's correct on Saturday, August 3, and every first Saturday in each month from then and on. It is much more detailed than the earlier one, so you should all check it to see whether your values are correct, they probably aren't. Wool, wood, glowstone and other items have all been split up, for example. You should only fill white spaces, the gray ones update automatically. So, just to clarify, you want us to update on the first friday of each month or update on the first saturday of each month (or on the day before the first saturday of the month in case the 1st of the month actually does land on a saturday)? Also, if you're going to list every possible thing, you're missing poisonous potato, though they really have no use right now. For bookcases and books, do you want to count the books stored in the bookcases themselves? This is just an opinion, but shouldn't the totals be AFTER the things that it is a total of? I'd understand if you have to rearrange a whole bunch of equations if you were to change it. Collective storages must be registered in this document, and their manager must update the document so that it shows the correct values the first Saturday (UTC) in each month. This means it would be a good idea to update it on Friday, and change it during the Saturday in case you move stuff in/out of the storage that day. In practice I will be copying the values probably around 9:00 UTC, plus/minus some hours. You can see the dates in the first row of every sheet in the Google document. If I've already filled the column with the specific date, there's no need to update it before next month. If you see I've copied the data and you didn't update it you can still update it and then tell me, then I will fix the values, but I would prefer if everyone remembered to keep their stats updated for when I copy them on Saturday. Also, if you're going to list every possible thing, you're missing poisonous potato, though they really have no use right now. I'm not, it would be impossible to list all the millions of potential fireworks rockets, different colors of leather armor, enchanted tools etc. Because of this I've excluded certain items, which I think the item library system works better for. I've considered adding unenchanted diamond tools and iron tools though. I've also considered whether we should allow people to store maybe a limited amount of certain items (like enchanted tools) in private chests without using the item library system, I'm not completely sure about this idea. For bookcases and books, do you want to count the books stored in the bookcases themselves? What do you mean by this? Can you store books in bookcases? As far as I know, there are bookcases which are blocks, which would simply be blocks when you've stored them in your collective storage, the same way as a chest inside a chest can't hold items. If you mean the books (items) that the bookcase is made of, no, because there is already a cell for the books, so that wouldn't be needed. I put them before to have it work the same way as the categories, as a sort of headline before you see all the different clay types etc. and what will be the punishment of not updating? You should only fill white spaces, the gray ones update automatically. They aren't the old items, they are used to sum up a bunch of items and are calculated automatically, they're grey because you shouldn't fill them, if you do, you break the calculation. If the values are found to be off during an inspection, an amount twice as big as the difference in resources may be confiscated and redistributed to the rest of UBSR's collective storages, excluding Spawntown. first of all, do i count blaze rods in my furnace? I see nowhere that says you need to have everything. In fact I am hardly planning on including most things. but you have to include everything listed in the spreadsheet right? I usually just put down what are in the chests designated as the collective storage chests. If it's private/locked, then yes. If you don't want to graph your items, put them in a public storage or an item library. 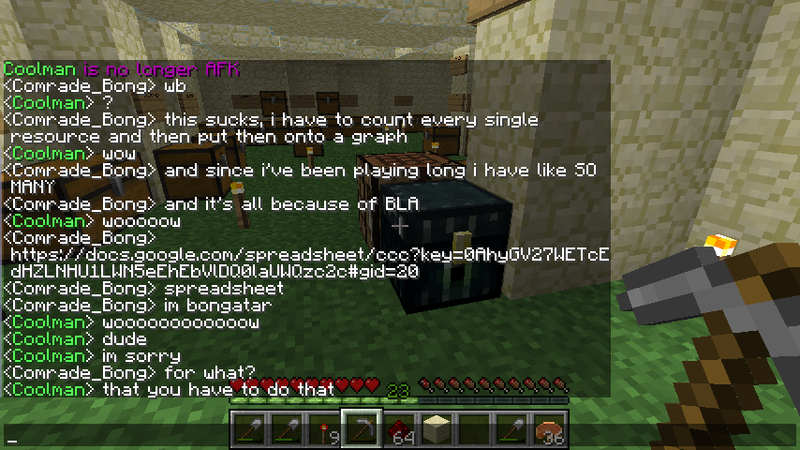 As far as I know blaze rods are very abundant, so if you want to save time graphing, you could simply store the blaze rods in publicly available chests/furnaces. You can put 0 if you don't have anything of an item, otherwise I will fill it with 0 when I update it on Saturday anyway, because I assume people list the items they store. Again, I recommend that you reconsider what you store in the collective storage if you don't want to spend the time on updating the sheet. You seem to have put many more items than the rest of us into your collective storage in the past, which was one of the reasons I had to include all the other items in the spreadsheet. I would prefer if people would only store items listed, and request more items to be added to the list, if they need to store different items. In any case, it's only once a month you update it (unless you update it when you take items out or store them, but that will probably take more time considering how much you use your collective storage), if you for some reason don't have time some day I might be able to do it for you but not all the time. Whoops! Forgot to update the collective storage last night, doing it right now. Note on the wool: I see you last accessed the chest 59 days ago, so this number (1232) must've been different from the reported number the last month (1134). 5 glass bottles were additionally found, but couldn't be listed in the spreadsheet. You came online during the inspection, and I see you just forgot to update it, plus I was the one who deleted most of the values when I added all the new items to the spreadsheet, so I don't think it's fair you should compensate for the values being off. The wool I don't think you miscounted intentionally, but according to the law you would actually have to pay 196 wool to the rest of UBSR (excluding Spawntown) in compensation for it. The colors weren't listed then, so you get to choose the colors. Do you accept the 196 wool to be redistributed? In other news, the spreadsheet is now updated. It reveals that UBSR now has more than 20,000 coal and 15,000 redstone. How amazing. Yeah, I had forgotten to do it yesterday, sorry. As for the wool, I don't remember what it was that I had altered almost two months ago and all that. It's possible that I simply miscounted because I have so many different ones, by a rather large number. For the glowstone, nether brick and other stuff besides the separated wood types (which wasn't an option before), I thought I had counted them in the previous collective storage document. I don't think ghast tears or blaze rods were an option before. I decided to stick the bookcases and two books in the collective storage because I have that surplus laying around. As for the 196 wool, you can redistribute the yellow ones since I have a good deal of those. Separating the colors is a good idea as that helps against miscounting. You can always just tell bla to keep it, or just put it in Spawntown public storage. Also, I divert whatever wool b-ong is sending me to Spawntown (or to whoever else wants it) since I don't really need more wool. ...Maybe we should implement the UBSR Collective Storage which is tied to the entire state rather than a region so that you can only poll resources out of it and store the wool in there? If so, we need to choose a place to build it. I don't have a problem with it not being in Spawntown, but I think it should be a place that we know will not leave UBSR, that would be a pretty stupid place to put the storage at least imo. I could update your sheets with the wool, that would be no problem, but I'm more worried that not everyone may have chests designated for it or even room for it, so I think it might be a bad idea to make the system this way. No, I'm suggesting the regional collective storages continue like now and one state collective storage that is managed only by voting is built for resources like this case. The resources in the state collective would be spent before the ones in the regional ones as well. I propose that the state collective is not in Spawntown, and instead somewhere else like Plaidania or Capital. I already proposed that. You're not in UBSR, so I don't see why you should have any influence on it or why you even care. Capital is in YUP, even though it follows UBSR economics I dont like the idea of having the UBSR State Collective Storage outside the UBSR state. The reason should be logical. Yqt has also said sometimes when I considered inspecting his collective storages that he might leave UBSR if I do that, so I have the impression that YUP regions may not be a very "secure" location for the collective storage in the long term, but Yqt knows that better than I do obviously. Plaidania, is a part of Chazabethia which is UBSR, but you seem to have been managing it the most, and you're not UBSR. It's not clear to me anymore who should be considered the manager. If it should be in Plaidania, then I think Plaidania should definitely be considered a permanent part of UBSR. I would suggest maybe Yukitown, Ampluterra, Matolony, or Revolutea as possible alternatives to Spawntown. They have been a part of UBSR for a long time, but they should consider whether they're sure to stay a part of it as a region first. Kakto City or Epicland (possibly Pine Hill) are other options which we know will be a part of UBSR. First of all its UYP. (Union of YQT Provinces) though YUP sounds better. Anyways, if Capital were to get this storage it would stay under the economic laws permanently. No need to worry about me leaving. However I see no reason why it shouldn't be in Spawntown? Revolt City and Matolony would be other good options as well. It would be cool to see a sort of Olympic style bidding for the storage, all interested participants have to sell their area to you as to why it should host the storage, but I dunno. so the storage is only for stuff that people miscoutned? And stuff people choose to donate to it, which people probably won't do a lot. It would be mainly for miscounted stuff unless we choose to use taxes etc. or something like that (which I don't currently think is a good idea). I think the reason why some people don't want it in Spawntown is because they think UBSR/Blacraft is too centralized and think there should be more incentive to travel to other places. Yes, it is fine if Plaidania is part of UBSR, I manage it but I want it to be in UBSR. Remember that September 7, next Saturday, is the next day where you must keep your collective storages updated in the Google document. Reminder: Tomorrow is Staturday for Blacraft, remember to update the Google doc with your collective storage contents. Remember to update collective storages for tomorrow. Added new wood types, saplings, leaves, new fish, packed ice, red sand, new categories with new flowers and stained glass + panes to the google document. I inspected Aahrus collective, it clearly wasn't updated, and I can see that none of you have touched the document since the update in December. Please update them. (No point in updating Aahrus now that I did it). If I find the values to be off by UTC midnight, resources will be confiscated according to the UBSR laws. Is it a problem for people to have the document display the correct values on the first Saturday in each month? Do we need to move it to Sunday or set a specific time like 20:00 UTC on Saturday when it must display the values correctly? When I wrote the law I intented to mean it should display the correct values for all of Saturday, but to avoid confusion I think I will change it to mean 20:00 UTC on Saturday, then those in USA/Canada should have time to update their stats on Saturdays if they have problem with Fridays. Tell me if the change is a problem to you. But if it's 20:00 UTC on Saturday, it'll be 21:00 or 22:00 for me and 12:00 for those living in the western part of USA, shouldn't that be enough time for everyone to update it? I'd like to keep it inside Saturday because I reserve Sundays for homework. It's 4 hours from Sunday but means that I can check the document before going to bed. If it's really an issue it can be moved to 21:00 UTC. You could also update it before the weekend if you know you're not going to play, maybe the weekend before, and then if you make a few changes to the contents over the next week you could write them into the document while playing. I always write the changes into the document while playing so it always displays the correct values - and then I don't have to look through everything once a month either. Collective storages must be registered in this document, and their manager must update the document so that it shows the correct values the first Saturday at 21:00 (UTC) in each month. the contents are kept constantly updated in publicly available books or signs on chests. UBSR inhabitants may request the items using books, signs or other means of communication. Remember that February 1st is the next Saturday, and the next time to update the Google doc. We don't conduct a poll once a month, I assume you mean we update the stats every month. We're interested in knowing how much stuff we have. If we didn't know what we had it'd be hard to make polls for resources in the first place. We need something to base them on and seeing how much stuff we have is interesting. I think this question has been asked many times before. before we had storage stats, there was hardly a single occassion if that, where we did not have enough resources to fulfill a poll request. And if we ever did, then the poll amount could be easily reduced, or only however many resources were present would be given. so it seems quite feasible to create a poll without knowing how many resources are available. Or you could just easily have storage stats, and those problems would be non-existant. It's not like they're hard to make. Bump, remember March 1st at 21:00 UTC is the next time when the collective storage doc must display the correct values.